"We have chosen a president," Haitian opposition leader Moise Jean Charles sais Tuesday, "Since the Creole version of the Haitian constituiton was never amended, it gives us the right to chose one member of the Cour de Cassation." 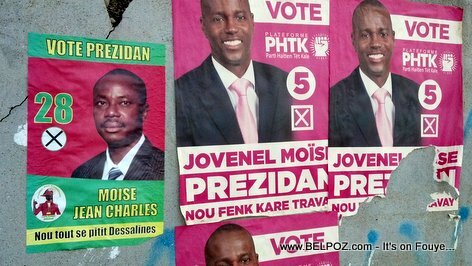 PHOTO: Haiti Elections Posters - Moise Jean Charles, Moise Jovenel, KI MOISE w ap Vote??? While the ammended constitution of Haiti, article 149, says the Prime Minister will take the place of the president should he not finish his term, the opposition makes it clear, they want nothing to do with Prime Minister Jean Henry Ceant, we will choose a president based on the unamended constitution, the creole version, Moise Jean Charles said.